I still believe it to be highly unlikely especially at 8 feet. I would estimate that after losses you would get less than 100mW actually returning back into the module. IDK, I just find it hard to believe that it would be enough to instantly kill the diode. I guess its physically possible just insanely unlikely. Personally, I do not bother trying to point mistakes out to people who are clearly too unintelligent to grasp the error since almost every time they will just jump to anger towards you and learn nothing because they are in denial of being unintelligent in the first place. At least that's what I have observed. Lol, I mentioned this once to my Dad and he thought it was highly amusing and agreed. This isn't my story but a story of a teen that lives in my city. Still I'd like to share it because it shows how irresponsible people can ruin everything for others. Two groups of late teens/early twenties were hanging out (lets call them group A and B). Suddenly someone from group B decides to pull a powerful green laser (I'm guessing one of those cheap ones from dx) and shine it at group A. He managed to hit one of them straight in the eye and burn a small hole in his retina. Now the person from group A has psychological issues due to his vision and to make it worse the guy who did it was never found. There wasn't even any kind of feud between the groups which could in some peoples minds justify revenge. These are the kind of people that get lasers banned (well they and the stores selling way overspeced pointers (no, you can't sell a 50mW laser and claim it's 5mW, that's like selling a 9mm and saying it's a bb gun)). Just wondering where is a good place to point a focused 2w+ laser? Something or someone gets burned every time one is turned on. Go outside at night and watch the sky/listen for a good 30 seconds for signs of airplanes or any other aircraft and then shine away. Keep vigilant throughout the use of the laser and try to maintain quiet while using them just in case you miss an aircraft or you cannot hear someone trying to get your attention. I think this is my new favorite thread, as I have much to share. Don't buy cheap eBay laser goggles. Make sure they are CD EN 207/208 certified! Always douple, triple check polarities on everything! Always wear an approved anti-static wrist (or ankle) strap when handling bare diodes and driver boards. Check the resistance on your strap. It should be somewhere between 1 and 100 Megaohms. Short the output of driver boards several times before connecting a diode. Short it good! Use a temperature controlled soldering station when soldering diodes. Set it as low as you can. Make sure all polarities are right! Use a soldering iron with a grounded tip. Check it with a meter to make sure. Work on an anti-static mat or table if you can. Check it with a meter if you have one. Check polarities again! One of them is probably wrong. Can you tell I have burned up stuff this way? Do not ever under any circumstances touch the business end of a diode. Check all windows and optics for dust, scratches, grease, fingerprints, etc. Replace. with a microscope if you can. You now have everything hooked up backwards. Check the polarity again! Use your fingers when the power is on to make sure things aren't getting hot. load instead. Flaminpyro is selling them over in the Pro Shop. Haha, yeah. It happens much too often. Thanks for the rep. I was Confused why my DTR laser came with the leads shorted, now i know! ESD can be a huge problem with laser diodes so they should always be shipped with shorted leads if they are not already built into a full laser. DTR always either packages his diodes in ESD bags or shorts the leads on his modules so it is never a problem from him. I had a similar issue. I was anxious to get my diode ($60) to work so i decided to put it on a low mA flashlight. Little did i know the driver was really crPpy and spiked to double its current when turned on. It fried my diode instantly. My eBay laser pen was really cool after I shortened it. 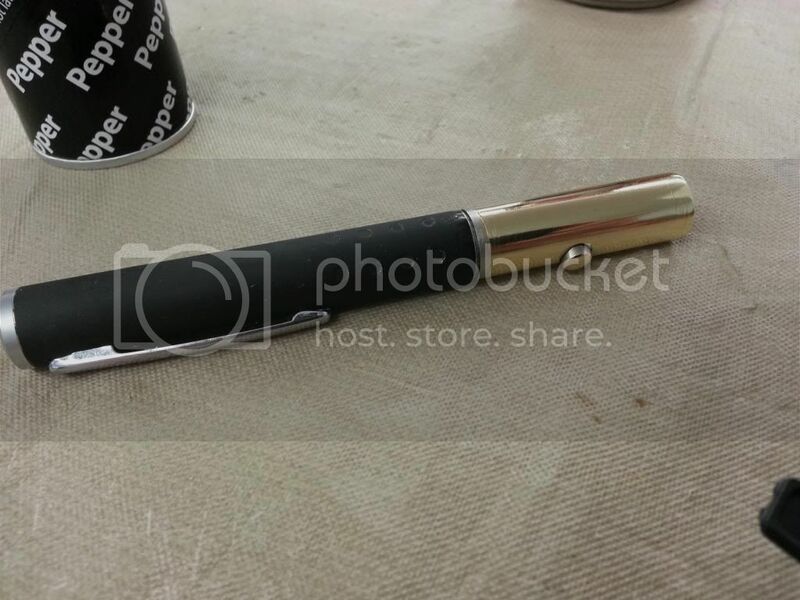 So I proceeded to sand the finish and polish the front half of the pen host. NEVER use steel wool on a working laser. Always take it apart first.